Why did I read this book: Both the striking cover and the intriguing blurb made me think that this was an Ana-book in all of its contemporary glory. Chloe and her older sister Ruby are the best of friends and the closest of siblings. No one knows Chloe like Ruby does and no one could possibly love her more. And the same can be said about Chloe’s love for her sister as well although that love is easier to understand since everybody loves Ruby. In the small town where they live, Ruby is the girl all the boys want to sleep with and all the girls want to be. The one who can get away with anything she does, the one who gets anything she wants. The parties don’t start until Ruby is there and they stop when she leaves. It is during one such party at the town’s reservoir, that things go really, really wrong. Ruby says Chloe can swim across the reservoir. Ruby says Chloe could never drown. Ruby says Chloe will swim its length and all will be ok. So of course Chloe will do it. But then she finds the dead body of her classmate London on a boat in the reservoir and all of a sudden Chloe is gone from their town, living with her estranged father, away from Ruby. For two years, there are only a few text messages. For two years, Chloe lives on standby. And then one day Ruby shows up and asks her to return so they can live together again like nothing ever happened – because all is back like it used to be. Chloe goes back, because how could she not and then realises that everything is indeed, just like that night two years ago. I wanted to read this book, and effectively made room on my reading schedule to read it based solely on the strength of its cover and its blurb both of which promised a straight contemporary story about sibling love. At the moment, this is exactly the type of novel I love to read and have been in the mood for. Thus, a contemporary story about sisters was what I thought the book was and I don’t think there is anything surrounding it that even remotely suggests otherwise. So I began to read the novel and the first impression was very positive as the prose is absolutely lovely. But as the story continues, it becomes clear that there is a degree of unhealthy obsession between the two sisters. Which is fine, I love Contemporary novels with psychological twists. But beyond that, it becomes clear that everybody loves Ruby and will do anything she wants and all I could think about was WHY because Ruby as a character is not really interesting at all beyond the fact that I am told that she is. At this point, I was irritated. The Ruby-this, Ruby-that was used to such an extent that it becomes really old really soon and the plot would not.go.on. beyond the Ruby-ness of it. At this point I was prepared to go on a rant about Manic Pixie Dream Girls as Ruby seemed to fit the trope so well. But then something that is decidedly not normal happens within the story. A plot development that sets this book firmly within paranormal territory. To sum up: this is SO NOT a Contemporary story. At that point, I had to readjust. I had to review what I thought I knew about the story and my expectations accordingly. All of a sudden, Chloe is an even more unreliable narrator. All of sudden, this is a Speculative Fiction story. All of a sudden, I need to see Ruby with new eyes. Was I able to do it? Not entirely. And that is a shame because the story is actually pretty good and some of the events enthralling, as it becomes clear what type of story it is. But I found myself reeling from what I believe to be frustrating mis-marketing. I believe that this means that people who love speculative fiction and who would love this book might pass it by and miss a book they might enjoy. This means that those like me, who just wanted a straight contemporary novel, might be frustrated. And even though I love Speculative Fiction, I am not even sure I would have picked this book up, certainly I wouldn’t have right now, had I known. Imaginary Girls is very creepy, uncomfortable and disturbing. In fact, it reads a lot like a Twilight Zone episode. But even though I love Twilight Zone, I only love it to a certain extent – because I am the type of reader/viewer that is always, always asking questions. And some questions in this novel are not answered at all (especially the WHY and the HOW EXACTLY) . In that sense, I don’t believe I am the optimum audience for this book and this particular brand of speculative fiction. 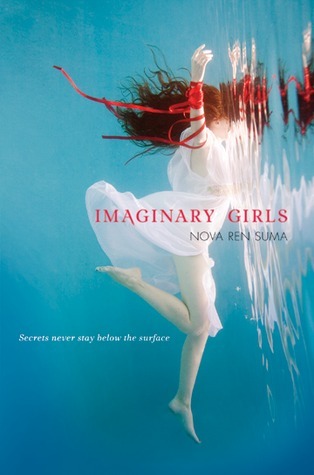 But I believe that to those who ARE, who love this type of story, Imaginary Girls will be a surprise – and a welcome departure from the usual paranormal YA fare. She’s five-and-a-half years older than me, so she has memories I don’t, can put me in places I’d swear I’ve never been (Lollapalloza, Niagara Falls, the Ulster Country Jail that one time, to visit our mother). If Ruby said I could swim all the way across, if she said I could dive down to the bottom no one’s ever put a hand to, find what’s left of Oliver, touch the floorboards of the houses flooded in 1914, and come up kicking, a splinter of proof in one finger, then maybe I can. Maybe I have. Ruby could turn me from an ordinary girl you wouldn’t look at twice into someone worth watching. Someone especial, mythical even. That’s what I got for being her baby sister. You can read the first 76 pages of the book online HERE. Additional Thoughts: After reading the book, I visited the author’s website and found out that she has written another book for Tweens, called Dani Noir. I bought it immediately – I liked her writing well enough and this one sounds pretty good. Not to mention that this author has been blessed by the cover gods. Fade in on thirteen-year-old Dani. It’s the summer before eighth grade, and she’s stuck in her nowhere mountain town with only her favorite noir movies at the Little Art theater to keep her company. But when a big secret invades the scene in real life, Dani can’t let it go. All she knows is someone’s been lying, and it all has something to do with a girl in polka-dot tights… Armed with a vivid imagination, a flair for the dramatic, and her knowledge of all things Rita Hayworth, Dani sets out to uncover the truth, and learns more about herself than she ever thought she could. Rating: I don’t believe I can rate this book as it was not what I expected to be reading at all. If it helps, I think it is a GOOD book so definitely well above the 6 mark. This is why I love your blog — completely honest reviews. I’ve been a bit curious about this book, but wasn’t sure if I’d pick it up. Now, I’m thinking I just might give it a try (and grab it from the library). Thank you! This is now definitely going on my TBR list. The cover has been catching my eye across the blogosphere, and the more I read about this book, the more intrigued I become. I still don’t know how I feel about Imaginary Girls. It was so WTF-y and then I felt let down by Owen. And then I was like, I love the writing. But I had no clue what was going on. I LOVE this well-thought review. Perfect, perfect. I haven’t read this yet, but I want to, despite that there are quite a few people who were a little, “goooood, but eh?” about it. Love your explanation – very fair and honest. TBH, I found the review of the book to match the cover blurb – which is being rather non-descript. It sounds like the kind of book I would want to throw at a wall halfway through. However, “Dani Noir” does sound fabulous. Aw, I’ve been curious about this book for some time so I’ve read interviews with the author where she admits it’s more magical realism (a la IF I STAY or BEFORE I FALL), so that wouldn’t do it for me. I definitely plan to check it out, as pretty writing makes me swoon, will be interesting to see what I think given I have the proper expectations, as it were. Dear Ana, I cannot believe that I had this book in my grasp and then passed it on to you without knowing that it was more of a Twilight Zone SF type of novel! I SO want to read Imaginary Girls now. @Gerd D. – I think rather than being nondescript or intentionally vague, Ana was trying to convey her feelings for the book and its mis-marketing without spoiling people by giving away what exactly makes the book a spec fic title. And, while I’m obviously biased, I think she did a FANTASTIC job. In my opinion, there’s nothing worse than someone blatantly spoiling away unwitting readers! I am reading this one right now, and, luckily I knew from reading reviews ahead of time that this was going to be more of a paranormal than a contemporary read. So I don’t exactly see Ruby as a MPDG, though I can definately see how one might view her that way–there’s something vaguely sinister about the way she is able to exert control over the people around her that speaks to her being more of a MAGIC than a MANIC pixie dream girl. 😆 I have a few theories about the book, but I’m going to reserve judgement until I finish reading it. So far I like it a lot, even if some of the metaphors make no sense. I understand why you didn’t give this one a rating; I often have trouble giving a numerical rating to books I’ve read. I sometimes have to “sit” on a mental review of book for awhile, to gain a bit of distance from it, if that makes sense, before I can properly evaluate it. Wow. I always love a book that you don’t expect! 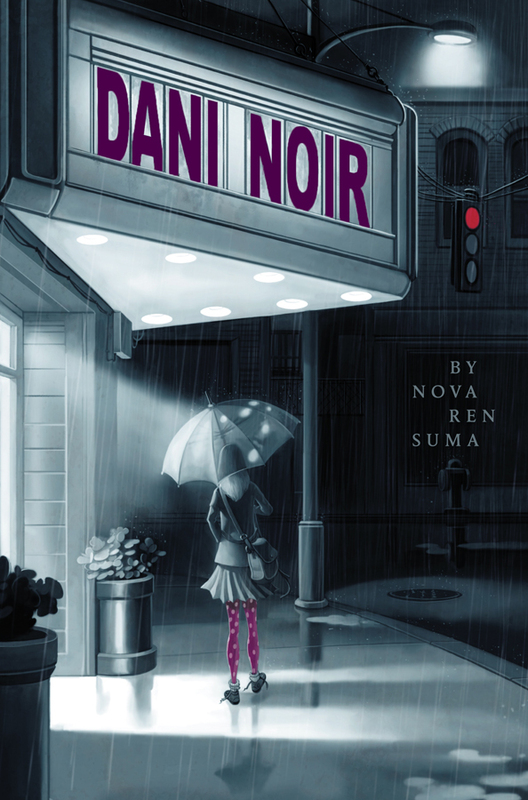 I want to read that “Dani Noir” book– love your guys’ reviews! @Thea: As I figure it the story relys on some sort of “revealing twist” which probably makes it hard to properly review the book, however from what I gather from another review of the book the presumed dead is alive and kicking again upon Chloe’s return? How come that this truly intriguing story detail didn’t make it in neither the blurb nor the books review? I hoped to be able to speak about my reaction to the book and examine it from a different perspective without actually spoiling the twist because what you just posted is EXTREMELY spoilery! It is not merely an “intriguing story detail” which is why I didn’t want to mention it, it is the point where the book takes a completely different turn. The character is not simply “presumed dead” – she IS dead, and has been brought back by Ruby….somehow. I think I made it pretty clear that I was having problems writing this review and it would have a different approach? Maybe this should have made the blurb of the book, and this way, it would have been clearer that this was SF. But since it didn’t, I didn’t think I should spoil it…. I was looking for interesting books to read at Walmart today and happened to see Imaginary Girls. Intrigued by the cover art, I read the first 2 pages, then realized my parents were at the register and I’d have to leave soon. Just finished reading this book. This review explains it perfectly, it is just plain freaky and I can’t wrap my mind around it. Being a very logical and liking my questions answered I was left disturbed and unsatisfied by this book. Exceptional imagery but too wishy washy and confusing. Couldn’t tell reality from physco crazy needs to be commited into a crazy hospital characters.